I was somewhat dismissive of headphones in my review of the room-filling Yamaha RX-V679. My point being that rather than using music to open up new worlds to us, we tend these days to pipe music direct into our ears to shut out the world when we travel and when we work. But I do use headphones, particularly at home at night to avoid disturbing the family. Wireless headphones, when they’re good, are my preference. And these Skullcandy Grinds are good. I was raised on headphones. My first radio (still called “the wireless” back in those days) was a crystal set with an adjustable cats whisker. Powered by nothing but the radio waves themselves, the output could only drive a pair of headphones, mono, of course, where the transducers were electromagnets wobbling thin steel diaphragms. Later I graduated to a DIY pocket radio repurposed from a valve-driven hearing aid, and later still to an early Clive Sinclair creation, the tiny Sinclair Micromatic, which I still have in the attic somewhere. It was headphones and earpieces all through my formative years. But wired headphones were always a nuisance. The classic tragedy would go like this: you’d be sitting down, with your foot unwittingly treading on the headphone lead. The moment you stand up—snap—the lead gets wrenched apart. Headphone leads have spilt coffee into my keyboards and sent laptops flying off tables. Bluetooth arrived at the turn of this century to rescue us from all this. It was a huge disappointment. The early implementations of Bluetooth audio compressed the living daylights out of the music, and the price for freedom from wires was two earfuls of mush. Bandwidth limitations dictate that stereo audio be compressed at the sending end and decompressed by the Bluetooth receiver. If the original music is already compressed using a codec the receiver can’t handle (as is usually the case with MP3 or FLAC), the Bluetooth transmitting device has to decompress before recompressing. This explains why in the early days Bluetooth music sounded terrible. Even worse was the fact that the processing time taken by all this codec activity introduced a lag in the audio that threw it out of sync if you were using Bluetooth for the audio track of a video. Happily Bluetooth bandwidth has greatly increased since then, and even the low power processors used in Bluetooth devices are now fast enough to minimise the lag to the point where it’s virtually unnoticeable. Those days are gone. Even in the absence of advanced codecs like aptX, current implementations of Bluetooth give the standard SBC codec enough headroom to deliver a near-CD quality experience. The Skullcandy Grind Wireless headphones don’t use aptX, and I’m very impressed with their sound. With plenty of bass, but none of the bottom-weighted artificiality of at least one of the better-known headphone brands, an evenly spread middle range and crisp top frequencies, these Grinds sound to me very much in the same quality bracket as my much-loved Sennheiser 550-Xs (original price around £350, now around £230). If your wallet can stand it, I’d advise going for the Senns. They trump the Grinds by having aptX, will do SRS surround sound, and are noise-cancelling. They also fold—somewhat—for travellling. The battery’s modular; I have a spare (an extra £35 or so) and can charge one while using the other. 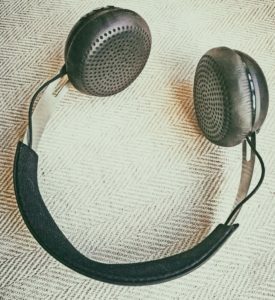 The big deal for me is that they’re over-ear rather than on-ear, which improves the comfort and makes for a better seal against environmental noise. If you’d prefer to keep the £160 or so change, the Grinds have their own upsides. The on-ear fit is among the best I’ve experienced with this class of headphone: a good seal and well-padded comfort that makes them wearable for long periods. They don’t fold, but they’re not too obtrusive dropped back over your neck when not in use. No noise-cancelling or pseudo-spacialisation, true, but the thing I like best about the Grinds is their sheer simplicity. Just three buttons to control all the functions. They’re very simple to pair—it’s easy to use the Grinds with the Bluetooth transmission from my RX-V679; with the Senns the pairing is more complicated. Unlike the Senns, the Grinds have just three buttons to power up and down, pair, control the volume, fast forward/rewind and skip tracks forward and back. And physically the Grinds have a form-follows-function elegance that I find really appealing. No blatant branding, just a small Skullcandy logo on the metal slide plate above each earpiece. Slipping the earpieces up or down these sliders is a robust, uncomplicated adjustment to tailor the headphones for your head shape. If you want headphones that shout STREET STYLE on the Tube, these Grinds may not be for you, although a variety of colour mixes and textures are available for those who need to make a personal statement. Of course—as all such headphones today must—these Grinds incorporate a microphone for phone conversations, discreetly tucked away in the right earpiece. Call acceptance and hang-up are controlled by the central round button. The internal battery lasts a whole day, and is recharged through a microUSB port in the base of the right earpiece. Next to the port is a 3.5mm audio socket that accepts the supplied audio lead that turns the Grinds into conventional wired headphones. If you’re looking for excellent sound, discreetly packaged in a classy no-nonsense industrial design, at a real value-for-money price, don’t let these Skullcandy Grinds pass you by.